Mutant rats from outer space with scale model sets and cute little beady eyed rats running around mauling everyone? Awesome! "The toothy terror begins when astronaut Sonja (Tasha Tacosa) travels with a team to a distant planet in search of life. The private firm that finances her mission is the Steel Space Corporation. The founder of the corporation is Dr. Steel, played by Randal [THE CURSE OF LIZZIE BORDEN] Malone. When her mission goes awry after being attacked by giant rats from another planet, Sonjaâ€™s ex-marine boyfriend Jake, portrayed by Ford Austin, has to race against time to save her from Doctor Steel. 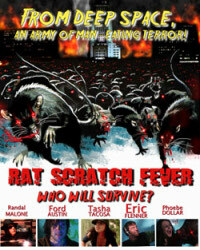 The rats then make it back to earth and takeover LA!" This just made my day!! Hells yeah!! Oh my god. You have to be kidding? -_- Is this like comedy? Or is it serious? Either way, it's looks funny.